Quantum electrodynamics (QED) predicts that a neutron will decay into a proton, electron and anti-neutrino. A small fraction of the time, this beta-decay process will also produce a photon. NIST recently detected this rare radiative decay (RDK) mode for the first time. We are currently developing statistical methods for analysis of the second generation version of the experiment (RDKII). In the experiment, RDK photons deposit energy in scintillators than then produce light. With some quantum efficiency, the scintillation light produces photoelectrons at Avalanche Photodiodes. Current efforts focus on Monte Carlo modeling of the photon transport and systematic errors due to the fact that photons need not deposit all their energy in the scintillators and development of impulse response functions for observed data and nonlinear calibration models to relate the measured peak height of voltage pulse produced by point sources of photons to the energy deposited in a scintillator. 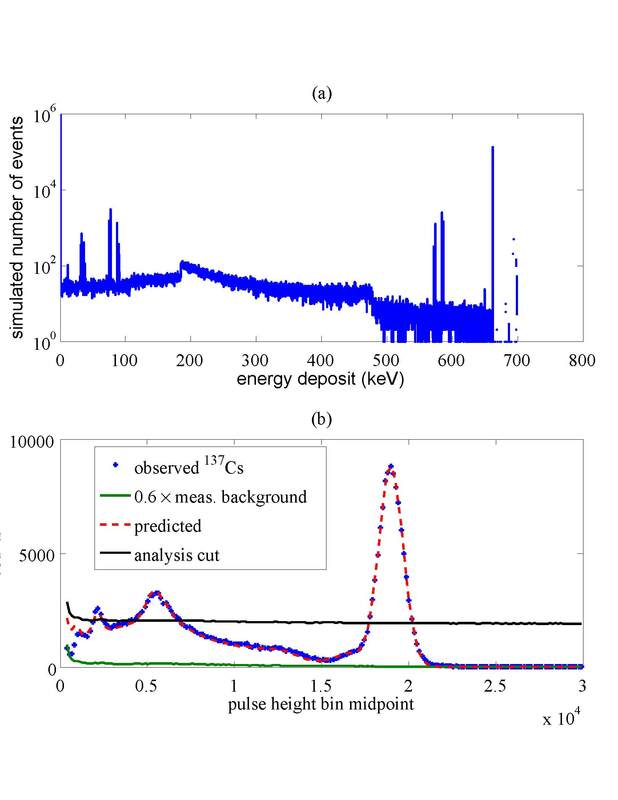 The goal is to quantify the branching ratio for this rare decay mode and quantify systematic errors in the observed energy deposit spectrum so that we can test the consistency of QED. When a neutron decays by its radiative decay (RDK) mode, it produces a photon with a energy spectrum predicted by Quantum Electrodynamics. These RDK photons deposit energy in scintillators which produce voltage pulses in Avalanche Photo Diodes. We are developing nonlinear calibration models to predict the energy deposited in a scintillator by an event based on the observed pulse height of an event based on calibration data due a Cs137 point source (b) and Monte Carlo estimates of the energy deposit spectrum of this point source (a).